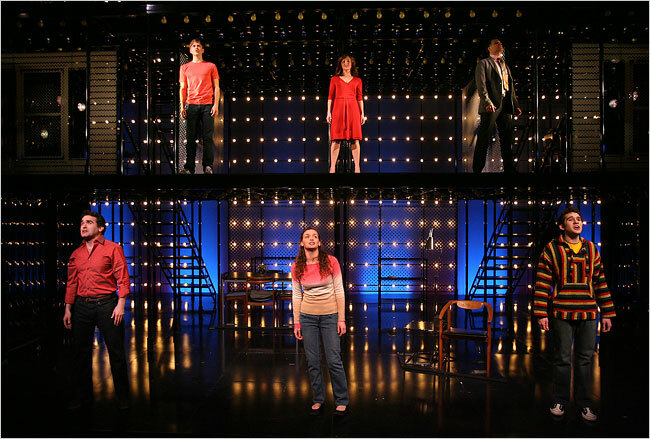 Next to Normal, a relatively new and award-winning musical on Broadway, was recommended to me by a number of different people. Being in New York, it was on the list of shows we had in mind to see. Next to Normal is ‘Rent‘ for the desperate housewives generation. Out goes illegal drugs, squats, AIDS and angst-ridden love affairs, in comes prescription drugs, suburbia, depression and angst-ridden family relationships. It’s been described as not a feel-good show but a feel-everything show. I think I’d agree with that. It’s not an emotional rollercoaster like Rent but an emotion provoking ride nonetheless. Perhaps, I’d say, a little too much in a downward direction. It’s a single story, there’s no inter-twining of different story lines, which meant that subject matters of family relationships, grief and mental illness are dealt with with little humour of escapism (the rock star psychologist isn’t quite Rent’s moo-ing cow-belled Maureen). The story lacks the humour and hopefullness which drove the characters in Rent and in Spring Awakening. There’s no message of hope, nothing that is clearly driving the characters forward through the dispair they’re coping with, or not. And perhaps it was a little too close to the bone for the Broadway theatre crowd. Afterall, while they’re unlikely to be living with a rent boy in Alphabet City chances are they could very well be stranded in Diana’s suburban family-constrained mental distress. The story didn’t inspire me to change my own life, as good theatre often does (although perhaps I’m closer-related to the Rent/Spring Awakening characters than I am to these) nor did it provide the escapism I like to get from musical theatre. However, it’s highly-praised score was performed brilliantly by a tiny cast – just six actors – cemented with amazing stamina by the lead actress Alice Ripley (who won the ‘Best Lead Actress in a Musical’ Tony award for this role in 2009). Her son in particular, played powerfully by Aaron Tveit complemented her extremely well. Overall, a musical worth seeing, with brilliant performances.